Often thought to be reserved for summer, camping is fast becoming a year-round activity. And while camping trips are planned with hopes of good weather, severe weather always is a possibility, but it doesn’t have to diminish the enjoyment of camping. To make the most of camping safety tips, it’s important to consider the weather before packing up the camper or travel trailer. Severe weather can occur anytime of year and often with little warning. According to NOAA, lightning is one of the most underrated severe weather hazards because it usually claims one or two victims at a time and does not cause mass destruction. “You are in danger of lightning if you can hear thunder,” states Weaver. “Seek shelter inside an enclosed structure; if that is not possible squat low to the ground, with your feet close together and your head between your knees.” Maintain minimal contact with the ground and do not lie flat. In the Southern U.S. states, peak tornado season is March through May. Northern states are more likely to be hit with tornadoes during the summer. People know that during a tornado warning they should move to an interior room with no windows, or in a basement. When camping, that’s not a viable option. Experts suggest retreating to a ditch or other low area, get as low to the ground as possible and cover your head from possible debris. “Do not seek shelter under an overpass; they act as wind tunnels during a tornado,” Weaver warns. Author Brad Herzog and wife Amy of Pacific Grove, Calif., have been camping for nearly eight years. During their first trip, Brad authored “States of Mind,” a book, which chronicles their experience. One night, while camping in Mississippi, they encountered severe weather. “There were late-night tornado warnings and we were able to track the warnings by keeping tuned to a local station,” Herzog explains. They were aware of the warnings in advance and took precautions in case of a tornado strike. Fortunately the storm passed without any tornadoes touching down. Floods and flash floods also are serious threats to campers. “Most people underestimate the threat of water,” Weaver explains. “Never attempt to drive through standing water. It only takes 18 to 24 inches to float most vehicles.” According to Weaver, canyons are particularly prone to flash floods. She recommends not only paying attention to the weather around you but also upstream. If flooding is a possibility in your camp area, immediately move to higher ground. Make camp before dark. Traveling after darkness has resulted in many accidents from falls, so travel during daylight whenever possible. Check for potential hazards. Be sure to check thoroughly for glass, sharp objects, branches, large ant beds, poison ivy, potential for bee stings and hazardous terrain. Avoid areas of natural hazards. Check the contour of the land and for potential trouble due to rain. Build campfires in a safe area. Your open fires and fuel burning appliances must be far enough away from the tent to prevent ignition from sparking flames and heat. Beware when encountering wildlife. Use a flashlight at night  many animals feed at night and the use of a flashlight may warn them away. To ward off bears, keep your campsite clean and do not leave food, garbage, coolers, cooking equipment or utensils out in the open. Watch out for bugs. Avoid attracting stinging insects like mosquitoes by wearing light colored clothing and avoiding perfume and cologne. Beware of poisonous plants. Familiarize yourself with any dangerous plants that are common to the area where you are camping. Think before you drink. No matter how clean or pure stream water looks, it's likely to contain water-borne parasites and microorganisms that can cause discomfort or serious illness. Not only should campers remain cognizant of possible severe weather; they also need to be mindful of extreme temperatures or sudden climate shifts. “Extremely cold temperatures and winds rob heat from the body,” says Weaver. This, increases your risk for hypothermia and frostbite. When camping in the winter, pack extra blankets, food and water to reduce these risks. It takes planning to handle any weather Mother Nature might throw at your camping trip. 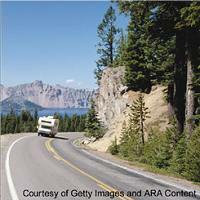 Simply following some basic tips can lead to a much more enjoyable camping experience. * Check the weather before you leave home. A variety of Web sites offer weather forecasts seven days in advance. NOAA’s Web site can be found at www.weather.gov. * Carry a weather radio at all times. Available at most electronics stores, a weather radio can be programmed to a specific location and provide life-saving notification of a fast-developing storm. * Talk to your camping group and develop a contingency plan should bad weather arise. When it comes to providing peace of mind and safety while camping, nothing rivals a reliable power source. Onan, a leader in power generation products, recently introduced a generator designed specifically for the smaller, towable RVs. Onan’s Camp Power is the first installed generator to provide power to the towable RVs so popular with millions of campers. Now when RVers are caught in severe weather, they can have the electricity they need to operate communication devices to monitor the storm and signal for help if necessary. Brad Herzog knows how reassuring it is to have reliable power with you when the weather turns bad. “When the weather is iffy, it’s nice to be able to tune into a news station to know what’s up.” Since weather can change quickly, it is important to constantly keep track of it while camping. In addition to powering weather devices for travelers, generators can make camping more comfortable by supplying power to air conditioners to cool the RV or run heaters on cold days. And rain won’t put a damper on campfire cooking for campers with Camp Power installed towable. A generator can power almost any electrical kitchen appliance. Travelers can cook meals in the microwave or on an electric grill when the weather doesn’t allow them to build a campfire. Despite all your preparations, sometimes the weather simply won’t cooperate with your outdoor plans. But that doesn’t have to ruin the camping experience. “The great thing about being in an RV is if you don’t feel that the weather is conducive to driving, you can pull over and you have your house with you. With powerful generators in your RVs, you can be anywhere and have the conveniences of home,” says Herzog. With planning and preparation, it’s possible to camp year round in almost all kinds of weather. Checking the weather forecast regularly, listening to a weather radio and knowing what your group is going to do in the event of bad weather allows campers to have a safe and fun trip anytime of year. To get up to the minute weather related information, log on to weather.gov.